All six issues of the series Jim Butcher’s The Dresden Files: Dog Men were released by Dynamite Entertainment in 2017. This month, you will be able to purchase the 144 page hardcover release of the book in its entirety, combining all of the issues in one neatly bound graphic novel. Before beginning my review of this book, I should point out that this is my very first experience with anything related to the Dresden Files. I will have no way to compare it to the original novels in any way, so my review is completely standalone. This title, though based on the character created by Jim Butcher, has been written by Mark Powers, who is more well known for his work on several Marvel comic titles including Cable, X-Men and Wolverine. The story follows Harry Dresden, a powerful wizard who, in the midst of battling his own current guilt and inner demons, agrees to help an old friend and fellow member of the High Council, Joseph Listens-to-Wind on a journey to a rural Mississippi town where a family has been ripped to shreds by an unknown assailant. Listens-to-Wind requests the help of Dresden, as he is certain that this crime has not been committed by human hands, and Dresden, as a renowned wizard and detective is certainly the right man to accompany him on his trip in order to protect the innocent townspeople from the grasp of something supernaturally sinister. I personally felt that the story started off a little bit slow and clumsy, as if the writer were struggling with getting his footing and being able to truly showcase who Harry Dresden is, what he is capable of and his constant inner torment. I am sure I am not the first person to make a John Constantine parallel when it comes to Harry Dresden with his supernatural power, ruggedly handsome looks and snarky, arrogant personality that often lands him both in trouble and suffering with a lot of guilt, but I could definitely see fans of the Hellblazer series being a fan of this one as well. The book picks up a lot of speed in the following issues and you really grow to have a relationship with Dresden and the team. It truly has a fantastic blend of character development and exciting, bloody action sequences. We watch Dresden grow as a character throughout the entirety of the series and by the end he is certainly one that is likeable, funny and relatable. There is a lot of heart in Power’s writing, and I think this book is certainly one that could be appreciated by all audiences. As mentioned previously, I can not compare his work with Butcher’s, as I have never read any of Butcher’s work, but from my personal experience, I would imagine long time Harry Dresden fans will certainly get a kick out of continuing to read about his adventures and seeing him come to life through the artwork. The artwork, done by Diego Galindo, is very compelling. Though not always heavily detailed, the art in the book packs a punch where it should. The various supernatural beasts and monsters are downright intense and all of the action sequences draw you in with their bright splashes of color and depictions of violence and pain. I definitely can appreciate how much work Galindo put into using his artistic talent to create emotional moments and expressions that each prominent character experienced. The art for this book was a perfect addition to the writing, complimenting it well with its alluring style. 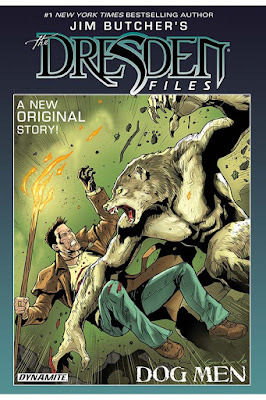 The hard cover collection of Jim Butcher’s The Dresden Files: Dog Men is certainly an exciting, action packed read that any fan of supernatural thrillers is sure to enjoy. Whether a longtime fan of the franchise, or a newcomer like myself, there is plenty to appreciate in this graphic novel.